With unbelievable panoramic coastal views, we are extremely pleased to offer this substantial and prestigious family home to the market. Occupying an enviable location within a secluded cul de sac, this very fine site with a modern home ready for immediate occupation, enjoys the benefits of a paved courtyard to the front with off street parking for a number of cars, lawned gardens, enclosed deck and sunken patio - all sure to enhance out - door living. 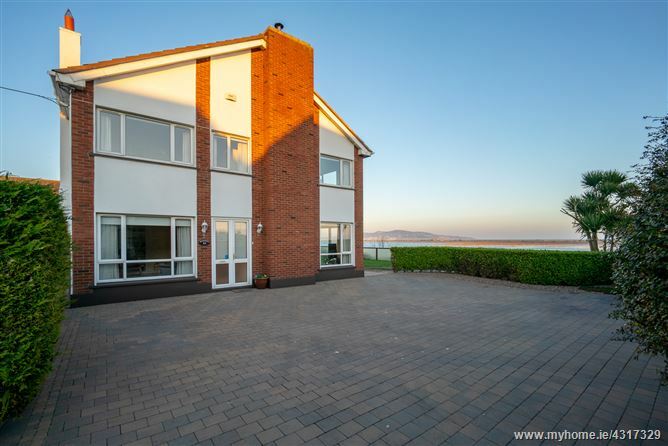 Close to Raheny village, and with Clontarf, Sutton and Howth close-by, the area is fantastically well serviced. DART and frequent bus services are available locally. Raheny has retained its’ own very special village feel and has become a popular mecca of specialist shops, boutiques, cafes and eateries. Beside the magnificent St Anne’s Park with its rolling lawns, amazing walks, internationally famous Rose Gardens and soon to be opened child friendly pet farm, leisure facilities are well catered. The sea-front promenade and cycle paths are enticing and of course the Bull Wall and Dollymount Strand offer their own great facilities. Numerous primary and secondary schools are close-by. Access is easy to East Point Business Park, The IFSC, the city centre, Dublin Airport and the M50/ M1 road network. Convenience is definitely the key! A huge array of sporting and leisure facilities are on the door-step with the great out-doors offering wonderful cliff walks on Howth Head, while plenty maritime activities in the form of sailing, surfing, and wind-surfing are immediately available. A huge selection of rugby, football, golf, tennis, sailing and yacht clubs make for an active social life.